State Police report a woman walking on Greenough Boulevard near Grove Street in Watertown yesterday afternoon was grabbed from behind by a man who forcibly kissed and groped her. Read more. Remember the old days when it took forever to get anything done at the Registry? Wasn't it great when they installed that new computer system and everything just sped up? Wait, what? Oh. Around 12:50 p.m. Tommy Von got in line to get a ticket to get in line to get to a counter at the Watertown RMV. 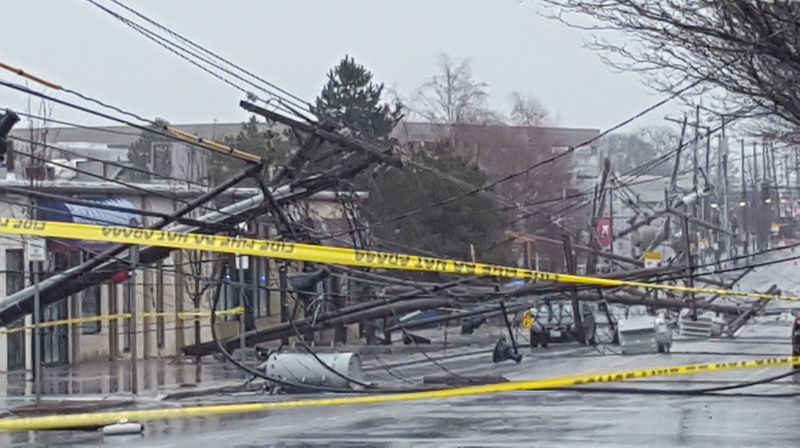 Dmitry snapped the carnage along Arsenal Street, reports more poles could topple. Jeff Behn shows us the fire on Williams Street. This is not your father's Arsenal Mall. Pia Owens reports on an attempt to find the best donuts "from every local shop we could find within a 10-mile radius of our home in Watertown, Massachusetts, plus Dunkin’ Donuts as a control group." Watertown News reports (last item) that a member of the local constabulary will be having a chat with a guy who keeps calling the local historical society and leaving lengthy voice messages about how "the Historical Society misrepresents historical facts." A Tufts Health Plan member-services clerk who handed over information on several thousand plan members so her brother and a pal of his could defraud Social Security and the IRS was sentenced yesterday to three months in federal prison, followed by nine months of home confinement, the US Attorney's office reports. Read more.